CvsH is 2 years old this month! As always, thanks for reading my comics and for your emails, comments and support. You’ve been awesome, and I just want to let you know that I’m very grateful for everything. Oh, and I’ll do a mini giveaway in my next post. congratulations! I hope that CvsH can make us happy for many years!!! 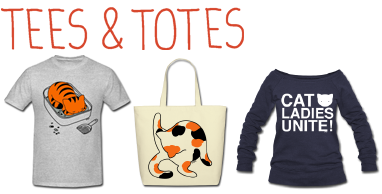 Congrats to all the kittys, the comics, the blog and everything else!! Thanks for doing this here - you make me always smiling and laughing! My cat, Lunchbox, is 2 years & 3 months today. Thank you Yasmine for these incredible 2 years! I´m a huge fan of your work and I have to say that i´m glad to share my love for kitties with so many people and feeling identified in every single one of these comics! Hhehe happy anniversary! It's just like kids - they always want the box more than the toy in it. I never expected to be understood in such a way as I am in this crazy cat world. You make me love cats even more. 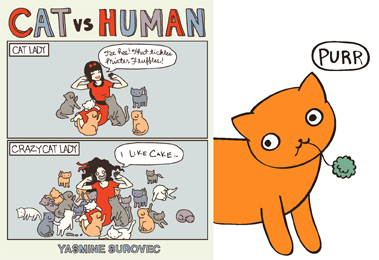 Happy Birthday Cat vs Human! I can relate to every one of these comics. Hope it continues for a long, long time purrrrrrr. 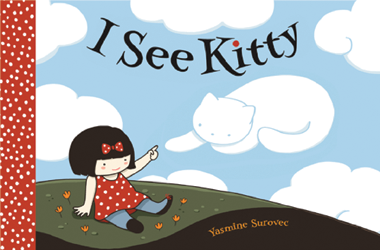 ConCATulations are in order to you, Yasmine! Happy Birthday! You always make me smile!!! Thank you! My kitty loves Q-tips as presents! He'll throw them up in the air using his mouth and try to catch them in his paws. Oh my!! I thought only MY kitty loved Q-tips. He does the same, then leaves them around after he's bored and our other big kitty pulls the 'cotton' off the ends and leaves them around the house. Well, my Mom throws them to him since he'll stand there while she's getting ready in the morning. He can smell them!! They always end up under the rug in the kitchen. Hee Hee...that is what we gave our two new rescue kittehs last week...besides a ping pong ball, the wad of paper is their favorite. congrats on the birthday! salutations! my cat boost can hear a receipt being screwed up to be thrown away from a mile off and comes racing in to intercept his new toy. must have about 50 receipt wads tucked under the fridge now. I gave my two sibling kittens not just a wadded up paper ball, but a wadded up cheeseburger wrapper. The things they did to that wrapper still give me nightmares to this day. Happy blogoversary! I have some wads of paper I can send you if you'd like! Happy Birthday! Print this out and crumple it up to get your present. Congratulations! CvsH is great, I really love it. Hope there are still many more years to come! With four cats at any given time, we can always relate to each comic. Congratulations! Happy birthday!!!! I very like this blog!!!!! Happy Birthday! I love your comics! So cute! My cats' favourite gifts are shoelaces and the insides of Kinder Eggs. Happy Birthday! I love this blog and your comics! I have 3 cats and I love reading your comics! Your blog is the cutest. New favorite thing!! Thank you for making these comics. I would not want to live without. Wonderful blog. So happy I stumbled across it! Happy anniversary! And thank you for making my day with every single post you publish. You freakin' rock. When the folks over at Ergo Baby contacted me ergo baby carrier and asked if I’d been down for trying one of their ergo baby carrier australia, I couldn’t hit the reply button fast enough. Ergo has a great reputation for being one of the best ergo baby carrier sale on the market and I’d heard rave reviews from so many of mama friends.